LIUNA members get dispatched to jobs all the time. No big deal, right? Well, for LIUNA Local 3 member Eddie Osborne, the job assignment he received late in the evening of May 13th IS a big deal, and a whole heck of a lot different than the standard concrete pour or scaffold building. On that day Osborne was elected by the voters of Newark, New Jersey to the position of Councilman-at large. For the 28-year member of the Laborers Union, winning election to Council in New Jersey’s largest city was not only a culmination of a vigorous six-month campaign, but also a near lifetime of public service. LaborNET sat down with Councilman-Elect Osborne to discuss politics, unionism, and what the future holds? LN: First question, what made you want to run? EO: I see public service is an extension of my union career--working collectively to promote and protect the interests of working people. Also, I grew up and raised my children in Newark and want to be a part of building something better for the next generation. LN: OK, we know why you ran for office; now tell us why you won. EO: Three things come to mind. First, I think it was because of issues. Newark families want what all families want, an opportunity to advance in life and overcome life’s barriers, but in Newark those barriers are much higher and make life tough harder. Safer streets, better schools, and a policy that creates jobs in Newark and for Newark made sense to people. Secondly, I think I benefitted from my union affiliation. People are frustrated by the widening inequality in wealth, as well as government’s inability to do anything. They looked around and asked who is working for them and see unions on the frontline. That helped. Lastly, I won because of the tremendous army of volunteers, especially from my union. 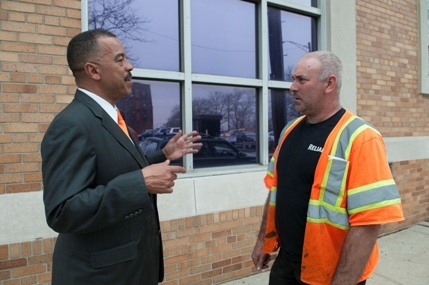 You couldn’t turn around on Election Day without seeing LIUNA’s orange shirts. EO: Well, our work has already started. Thankfully, Newark also elected Ras Baraka as mayor, a man who shares my ideals and convinced Newark residents to believe in themselves. After such a spirited election, I will spend some time reaching out to everyone—to thank my supporters and offer an olive branch to my competition. Newark will only succeed if we can now bring people together, so I think it is important to shift our focus from campaigning to governing. LN: Finish this sentence. Four years from now I want….what?. EO: To have all of Newark taking pride in and seeing progress from their local government and elected officials. We can’t solve all of Newark’s problems in four years, but we must be on the right track and people must see results. Good government can have a snowball effect. Positive change brings upon more positive change. Believe in Newark isn’t just a slogan, it is my mission.